The most well known Bhutanese musical instruments are drangyen (lute), chiwang (also known as pewang, or fiddle), lim (flute), and yangchen (hammered dulcimer), which are all used to accompany traditional songs and dance. All of these instruments have a long history in Bhutan except the yangchen, which arrived with refugee Tibetan musicians in the late 1960s. Additionally Bhutan is home to a number of interesting percussive, string, and wind instruments made from local natural materials. This web page describes some of the widespread instruments of Bhutan as well as instruments specifically from Kheng, a remote rural region where MBRC has undertaken a focused study of the music culture. The drangyen, or Bhutanese lute, is the oldest and most famous instrument from Bhutan. With its distinctive chusin shaped head (a sea monster designed to scare away any evil spirits attracted to its beautiful music), meticulously hand-carved body, and haunting, softly melodious sound, the drangyen embodies the unique musical tradition of Bhutan. Literally, its name means “hear the melody” (dra means “melody” and ngyen means “listen”). Many consider this fret-less instrument a difficult one to master. The drangyen must be carefully rendered to create its unique sound. It is made from wood, leather and yak or ox bone. A typical drangyen is approximately 3-4 feet in length, with a diameter of 6-12 inches. It is played with a plectrum of triangular bone, wood, or horn. Seven strings are suspended over a resonance chamber and attached to a rounded stem at its base. The drangyen has two bridges, one over the belly and one at the neck. The former bridge is designed so that the six main strings create a buzzing sound when plucked. Three sets of double strings are generally tuned to ‘G’ (pancham), ‘C’ (sadhaj) and ‘F’ (madhyam). In addition to these six strings, the drangyen has a supplementary string called ting ti, which is tuned to the higher octave ‘C’ (shadhaj). The ting ti is usually played as an open string to produce a drone/rhythm effect (chikari), but it can also be used as a normal melody string. 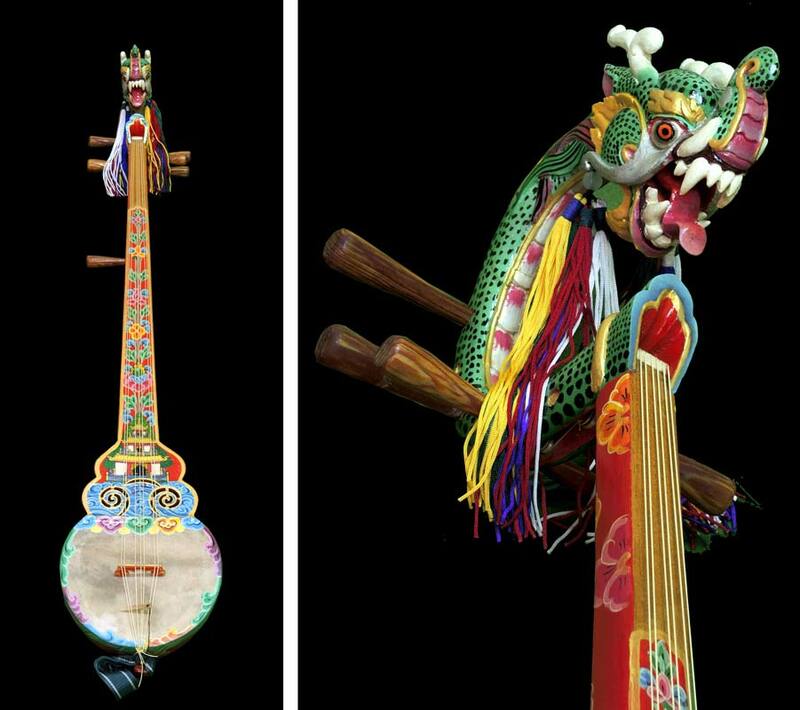 The drangyen is the main instrument used to accompany songs in Bhutan. Historians estimate that the drangyen dates back to the 8th century A.D. when the saint Guru Rinpoche brought Buddhism to Bhutan. In monastery murals and thangkhas (religious paintings), the Guardian Deity of the East, Sharchog Gyalpo, often holds a drangyen so that he can communicate without causing the destruction that would follow from using his fearsomely powerful voice. Lhamo Yangchenma, the Bhutanese goddess of music, also carries a drangyen. Generally this kind of musical instrument is made from an ox, cow, or buffalo horn. The resonance box of the horn is covered with goat leather. A wood stem with two pegs at the top passes through the center of the hollow horn. Two strings then run from the pegs down the stem and over a wooden bridge placed in the center of the horn before attaching to the stem at the bottom of the horn. A cotton thread in the middle of the stem is tied around the strings. The total length of the chiwang is around half a meter in length and 4cm in diameter. The chiwang is played with a bow made of dried bamboo threaded with horse tail. Rayon is rubbed on the horse tail in order to produce a better sound. The string towards the right is tuned to “la” and the left is tuned to “mi.” The fingers of the left hand press the strings in order to produce additional notes while the right hand bows. There are several varieties of flute in Kheng, and each variety has a distinct name. The flutes are differentiated by the distance between the mouth hole and finger holes. Bai-jing consists of a simple cylindrical bamboo tube of uniform bore closed at one end. The mouth hole is pierced at a distance of about three-forths of an inch from the closed end. It has three-forths of an inch major finger holes and one slightly bigger mouth-hole. It is about 2 and a half feet in length and broad in width. Various notes and micro-tones are produced by opening and closing of the finger-holes. Dong-lim is another very popular bamboo flute that is heard in Kheng, where it is called badui-pa jing, or cow herder’s flute. It is approximately 20 inches long, with six main finger holes and a mouth hole in a straight line. Blown vertically, various quarter-tones and micro-tones are produced by partial opening and closing of holes. Cowboys play dong-lim in the deep jungle. Pay wang is another vertically blown bamboo flute, but it is a small one with a maximum length of 13 inches and a diameter of a half inch. It has six major holes, and a flexible, thin “li” or tongue inside that vibrates when the flute is blown into. The part which is meant to be inserted into the mouth is polished down to a thin shell so that it can also vibrate easily. As with other flutes, micro-tones may be achieved by partially opening and closing holes. The Chikang consists of an elastic, thin strip of bamboo bark or tissue (the “tongue”) that is affixed to a horizontal piece of bamboo. The strip projects a little beyond at one end, and at the other end it is held in place with a bit of dankay (a kind of sticky solid gum from a bee hive). The left hand holds the instrument with the help of thread, and the right hand pulls the instrument back and forth within the mouth as the player produces notes by inhaling and exhaling over the strip. Women are generally the expert chikang players, and carry the instrument with them throughout the day (the chikang is only 6 inches long and quite portable). To play the chikang well, the player must master circular breathing. 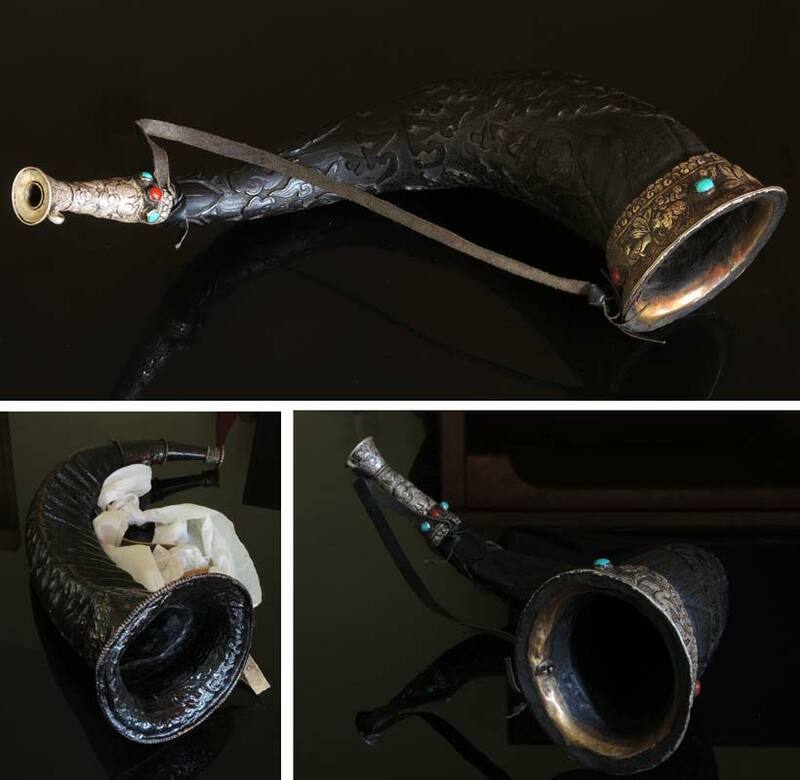 This wind instrument is made of large mithun (Indian bison), buffalo or ox horns. The pointed end of the horn is cut off so that air can pass through smoothly. Cow herders blow the horn once in the morning when the cattle are untied and once again in the evening to indicate that it is time for the cows to return to the shed. During the day it is blown to protect the cows from tigers, leopards, and other predators. The aungli is difficult to play and takes a great deal of breath control. This is another bamboo instrument used for chasing wild animals and birds away from crops. There are two types of kapka ma used in lower Kheng. The first is made of several poles of full length bamboo, about 18 to 20 feet long, that have been further hollowed out. The poles are hung from a cane rope, which is pulled from the distance of a half kilometer. Several kapkama are erected in different parts of the field to cover all directions. Yangkali is not man-made, but rather extracted as is from the forest. Yangkali is a fruit that grows on one type of tree creeper. It has a huge bean shape up to to 3.6 feet in length. Once dried, it has a hard shell that contains large solid seeds. Players can produce amazing rhythm sounds by vigorously shaking the pod. Male dancers hang the shaker around the left side of their waist during performance. This unusual two-stringed drone instrument of ancient origins is made of a piece of hollow green bamboo with both ends closed in. It is around 1feet and 10 inches in length, with an even cylinder shape and no finger board or frets. Its main function is to maintain accompanying rhythm and tempo, and no melody can be produced. Five bridges hold the two strings above the surface of the body. The center bridge, which covers a sound hole, is flat and bigger than the others so that the strings can be played with less effort there. The player uses two thumbs to pluck inward; alternately sometimes a hammer is used as with a hammered dulcimer. This is the most important of the percussion instruments used by Shamans in Kheng ritual practices such as the annual Choed-pala (a festival with Bon elements documented by the Music of Bhutan Research Centre in 2008). The nga is used widely with ritual dance/vocals, and players have developed brilliant techniques to produce a variety of musical patterns and styles. The nga is barrel-shaped with a hollowed shell made up of a solid block of wood. It is around 25 to 30 inches in length and 15 inches in diameter. The shell is covered in pasted leather pieces and laced with cane rope straps. The player wears the drum with a woven strap around his or her neck. The drum stick is a curved piece of cane. Although the origin of this drum is not known, it is believed to be derived from an earlier bamboo form of the instrument. The tamuru is one of the oldest known bowed instruments in Kheng. It is very popular in the communities of Goshing and Pantang. It differs from the chiwang in shape and material (bamboo covered with dried animal skin). The tamaru has only one peg, a string made of fibrous plant material, and no frets. The bamboo bow is strung with horse tail. The left hand presses the string while the right hand bows. The instrument is played vertically by resting it on the knee, or sometimes horizontally by resting it over the chest. Kralang ba is a bamboo wind chime that is used to chase pests away during the harvest. The instrument is made of six to eight bamboo pipes of different sizes, with both ends of each pipe closed in. The longest pipe will measure 25 to 30 inches and the shortest will measure 20 to 25 inches. The pipes are tied together in single circular row by means of rope made of cane and bamboo. The pipes produce tones in a pentatonic scale, and the chimes do not require any further tuning. Normally the kralang ba is hung on a bamboo pole which is 12 to 15 feet from the ground. On the other end, a long durable cane rope will be tied, covering a distance of half a kilometer from the hut. The sound is produced by pulling the rope to and fro to make the pipes clash into each other. The loudness of the sound depends on how much force is applied to pulling the rope.